Party spokeswoman Jun Hee-kyung criticized Moon for agreeing to a statement calling for the denuclearization of the Korean Peninsula instead of the North’s nuclear disarmament. Moon’s liberal Minjoo Party called the statement a “historic triumph” that can help set up successful talks between Kim and U.S. President Donald Trump on the nuclear issue. Japan’s leader is welcoming the outcome of the inter-Korean summit as a step toward resolving the North Korean threat. Prime Minister Shinzo Abe praised the talks Friday as a “forward-looking move.” He told reporters in Tokyo that he expects North Korea to take concrete actions toward denuclearization through its planned talks with the U.S.
Kim and South Korean President Moon Jae-in met in the border village of Panmunjom. They pledged in a joint statement to rid their peninsula of nuclear weapons, but didn’t identify any specific new measures to achieve that. Abe says he hopes to get further details and Moon’s evaluation of the talks when they talk by phone. 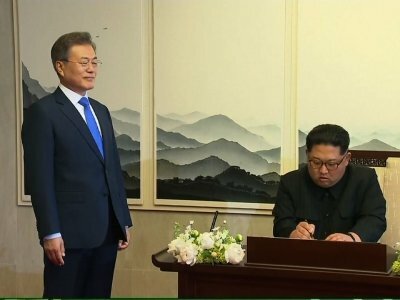 North and South Korea have agreed to stop all hostile acts over “land, sea and air” that can cause military tensions and clashes, after a summit between their leaders at a border truce village. The countries also agreed to take steps to defuse the relatively frequent clashes around their western maritime border by designating the area as a “peace zone” and guarantee safe operations of fishermen from both countries. The two Koreas have agreed for South Korea’s President Moon Jae-in to visit Pyongyang sometime this autumn. A joint statement didn’t say when Moon would visit Pyongyang. But it says Moon and North Korean leader Kim Jong Un will meet on a regular basis and exchange calls via a recently established hotline. The family reunions are expected to take place around Aug. 15, an anniversary for both Koreas celebrating their peninsula’s liberation from Japanese colonial rule after the end of World War II. While President Donald Trump has given his “blessing” for the Koreas to discuss an end to the war, there can be no real solution without the involvement of Washington and other parties that fought in the war because South Korea wasn’t a direct signatory to the armistice that stopped the fighting. North Korea has placed its nukes up for negotiations. It has previously used the term “denuclearization” to say it can disarm only when the United States withdraws its 28,500 troops in South Korea. The statement didn’t say what other specific disarmament steps North Korea would take. China has welcomed the summit between its ally North Korea and South Korea, saying it applauds the countries’ leaders for taking a “historic step” toward peace. The leaders on Friday walked unaccompanied to the bridge for a private conversation before they are expected to resume the afternoon session of the summit. It isn’t immediately clear what is being said between the leaders. South Korea’s presidential office said earlier Moon expressed satisfaction after the first round of talks with Kim at the border truce village of Panmunjom. The office says the leaders discussed the denuclearization of the Korean Peninsula and that working level officials from both countries are working on a joint statement. The pine tree dates to 1953, the year the Korean War ended in an armistice. The soil and water were brought from the Koreas’ mountains and rivers. North Korean leader Kim Jong Un and South Korean President Moon Jae-in aremeeting Friday in the border village of Panmunjom. Katsunobu Kato, Japan’s minister for the abduction issue, says he hopes progress will be made at an upcoming summit that Kim is expected to hold with President Donald Trump. British Foreign Secretary Boris Johnson is welcoming the summit between the two Koreas but says he doesn’t expect any great breakthrough that might curb North Korea’s nuclear ambitions. South Korea’s presidential office said earlier Friday Moon expressed satisfaction after the first round of talks with Kim at the border truce village of Panmunjom. The office says the leaders discussed the denuclearization of the Korean Peninsula and that working level officials from both countries are working on a joint statement. The leaders will resume their meetings in the afternoon after planting a memorial tree. Moon’s office says he and Kim are expected to announce the results of their meeting before attending a dinner banquet scheduled for 6:30 p.m.
Moon’s office says the banquet will be also attended by the wives of Kim and Moon. Also invited to the dinner are famous cultural figures from both countries, including the North’s Hyon Song Wol, the leader of Kim’s hand-picked Moranbong girl band, and South Korean pop star Cho Yong-pil. Seoul says North Korean leader Kim Jong Un’s wife will cross the border into South Korea to attend a dinner banquet after the Koreas’ summit talks at a border village. Moon’s spokesman Yoon Young-chan says that Ri will cross the border and attend the banquet with Kim, Moon and Moon’s wife Kim Jung-sook later Friday. Ri is a former singer with the North’s Unhasu Orchestra. Seoul says the leaders of the two Koreas had “sincere, candid” talks on the denuclearization of the Korean Peninsula”and other issues during their summit talks. South Korean President Moon Jae-in and North Korean leader Kim Jong Un are holding the Koreas’ third-ever summit talks at the border village of Panmunjom on Friday. Moon’s spokesman Yoon Young-chan told reporters that the two leaders also discussed how to establish peace on the Korean Peninsula and improve ties between the rivals. Though South Koreans and much of the world were able to watch some of the key summit events live, the only news available from North Korea’s state media well into the afternoon on Friday was a brief dispatch that leader Kim Jong Un had departed the capital to meet Moon inside the Demilitarized Zone that divides their nations. South Korea says North Korean leader Kim Jong Un described the country’s transport conditions as poor as he and South Korean President Moon Jae-in discussed Moon’s potential visit to the North. Moon’ spokesman Yoon Young-chan says Kim’s comments came after Moon expressed a desire to travel across North Korea to visit Mount Paektu that touches the country’s border with China. According to Yoon, Kim in response said such a trip might be currently uncomfortable for Moon because the country’s transport system was deficient. Yoon says Kim also said North Korean delegates who visited the South during February’s Winter Olympics also came back impressed with South Korea’s bullet train service. Yoon says Moon in response said North Koreans would also be able to enjoy the South’s high-speed trains if the rivals improve relations and reconnect their rail networks across the border. North Korean roads are often bumpy and poorly maintained. Kim earlier this month met with China’s ambassador and visited a hospital where Chinese tourists were being treated after a deadly bus crash killed 32 in North Korea. South Korean President Moon Jae-in’s senior spokesman said Kim said the residents of Yeonpyeong Island who have been living under the fear of North Korean artillery attacks and also families separated by the 1950-53 Korean War have high hopes for the inter-Korean talks to help heal past scars. Moon called for more meetings between the leaders and said he wishes to travel in North Korea to visit Mount Paektu near the country’s border with China. Kim said the trip under current conditions would be uncomfortable, but the North would improve its transportation networks should Moon decided to visit. Kim also said the North Korean delegation during their visit to the Pyeongchang Winter Olympics in February came back impressed by the South’s bullet train services. Television showed bodyguards jogging beside Kim’s black limousine as it rolled back to the northern side of the Panmunjom where Kim and other North Korean officials participating in the summit are expected to have lunch. The leaders plan to meet again in the afternoon at the southern side of the village for talks Seoul says are aimed at resolving the standoff over the North’s nuclear weapons. North Korean leader Kim Jong Un has thanked South Korean President Moon Jae-in for greeting him at a “historic place” ahead of their meeting at the border truce village of Panmunjom. Moon replied to Kim’s thanks by saying that the North Korean leader made a “very courageous decision” to come to the South. Kim Yo Jong has emerged as the most visible member of Kim Jong Un’s regime after her brother — since she became the first member of the ruling North Korean family to travel to the South in early February for the Olympics. She was in Kim’s delegation as he walked across the line that divides the two Koreas on Friday morning and took a seat beside him as he started his first round of talks with South Korean President Moon Jae-in. Kim wrote in the guestbook: “New history starts from now, at the historic starting point of an era of peace.” Kim earlier stepped into the southern side of a border truce village of Panmunjom to become the first North Korean leader to set foot into the South since the 1950-53 Korean War. Seoul says the meeting will be focused on discussing ways for North Korea’s nuclear disarmament and establishing a permanent peace regime in the Korean Peninsula. North Korean leader Kim Jong Un crossed over to the southern side of the world’s most heavily armed border Friday morning to meet South Korean President Moon Jae-in. They shook hands and inspected an honor guard before later holding a closed-door discussion about Kim’s nuclear weapons. The overwhelming focus of the summit, the country’s third-ever, will be on North Korea’s growing arsenal of nuclear weapons. South Korean President Moon Jae-in has left Seoul’s presidential palace for a high-stakes summit with North Korean leader Kim Jong Un that will kick off a new round of nuclear negotiations with Pyongyang. Hundreds of members of the Korean Veterans Association arrived on buses from different parts of the nation hours earlier to send off Moon’s motorcade. North Korea’s state media reports that leader Kim Jong Un has left Pyongyang for the North-South summit meeting with South Korean President Moon Jae-in. The report called the summit on Friday “historic” and noted that it would be held on the south side of the Demilitarized Zone, a first for Kim.